Okay, people. I have a crazy awesome bunch of news to share with you and a giveaway! Progresso got in touch with me and sent me a killer pack of awesomeness in celebration of their Souper You debut! I received fifteen cans of their light and 100 calorie soups, a calorie counting jump rope and a mug. Light Chicken & Dumpling and Light Italian Style Meatball. Both are 1 point (for you weight watchers,) per serving. That's 80 calories per cup, two servings per can. We both ate the whole can. The chicken and dumpling was pretty good - I only had two bites. The Italian Style Meatball rocked. Little bits of pasta and I'm telling you, the meatballs were really delicious. I wasn't sure how I'd like them, but they were great. Dan and I have been huge fans of Progresso soup for a long time, so this was really awesome. The variety in the soups they sent just blew my mind. I have three varieties of Chicken Noodle soup (my favorite) and they even sent some Onion soup! Who knew? So I'll be doing a few reviews as I come across soups I really like or ones that aren't so great tasting. I do know that low cal soup is one of my favorite options when I'm watching calories, and especially when it's cold outside. So. I want to tell you guys about the contest they're doing! From January 4 through March 15th, you can visit www.Progresso.com/SouperYou to enter the Progresso “Souper You Debut” contest for the chance to win a full makeover in New York City. Three grand prize winners will be awarded a trip for two to New York City from May 21st-23rd. The prize includes roundtrip airfare, a two-night stay in a NYC hotel, a full makeover, a $1,000 wardrobe shopping spree and personal consultation at a New York department store. Okay, so now for the giveaway! 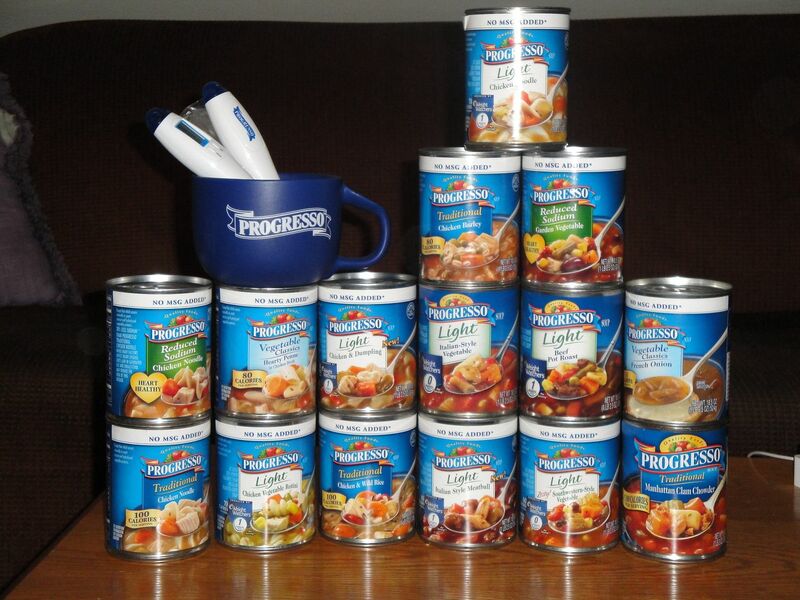 Progresso has provided me with a sweet gift pack to give away to one of you guys! It has the mug, the calorie counting jump rope, and two cans of Progresso Soup!!! I live in Australia, so I guess there's no point entering the comp! You are doing so well, very proud of you! That gift pack you got from Progresso is awesome! I absolutely love their soups, definitely great when you're doing the whole Weight Watchers thing! The Italian Meatball is good but my favorite is totally the Chicken & Dumplings (I just had it last night as a matter of fact, haha). I haven't tried them before, but I will now! Thanks! lol...thanks for the info...this looks like it could be a lot of fun!! What a sweet deal! I entered! Hi! You don't know me but i been lurking for awhile! I too am trying to lose weight so I have been reading your tips and such! Funny thing, I fixed a bowl of Progresso Southwestern Style Veggie soup just now, sat down to read blogs and your popped up! I have been eating a lot of them as the really are good!